Dylan was interviewed by Karl Zero, a famous French political talk show host & personality. He has also written and directed films such as "Being W" in 2007, a film in English where George W. Bush played by the American imitator Jim Meskimen, recounts his life and his world vision. The film was presented at the Cannes Film Festival in 2008. 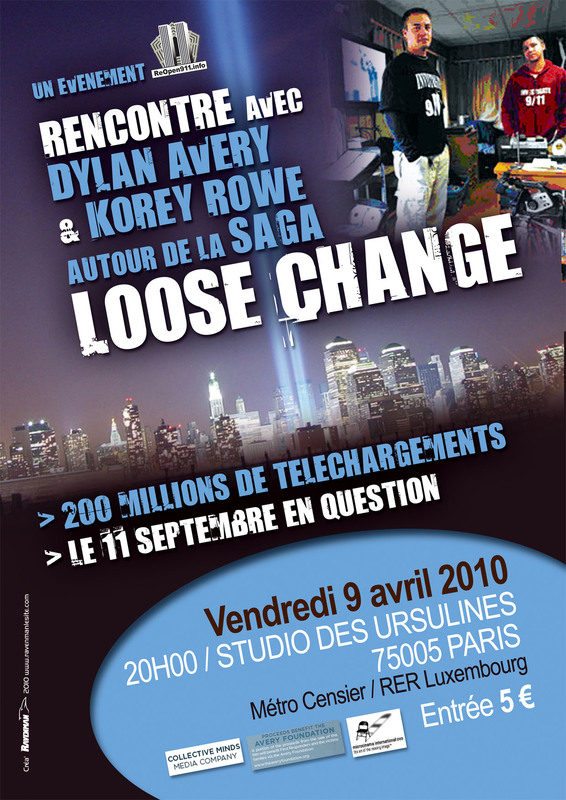 Dylan Avery et Korey Rowe also presented "An American Coup" at the "Studio des Ursulines" in Paris on Friday April 9th at 20:00. An event organized by the French association ReOpen911. A debate took place in-between extracts of the film. "LOOSE CHANGE" the most watch documentary film on the Internet! A 'thank you' goes to Karl Zéro for interviewing Dylan. And an even bigger THANK YOU goes to the BFM TV team for sending us his raw audio track, which made it a lot easier and quicker than subtitling the whole video back into English. If anyone can speak another language and would like to help us translate these types of videos into other languages, please do not hesitate to contact me. DJDaveMark on Mon, 04/12/2010 - 3:50am. John Bursill on Mon, 04/12/2010 - 5:06am. mouv4x8 on Mon, 04/12/2010 - 6:33am. You perforned very convincingly. Thanks also to mr Zero for allowing you to speak freely. Vesa on Mon, 04/12/2010 - 7:48am. .........What an awesome job ! Your getting better and better all the time. Thanks for all you do in our quest for the truth. I wish that this interview was done here on the major US stations. It's a shame that our bought and paid for media doesn't have the balls or intelligence to address the story of the century. WISDOM on Mon, 04/12/2010 - 10:34am. Even when losing your translator, you still manage to effectively get your point across. And I agree, you are getting better and more concise in your answers, looking professional, like you definitely know your stuff. Mekt_Ranzz on Mon, 04/12/2010 - 12:41pm. Especially emphasizing that the "government" was not exclusively behind the attacks. The apparent perps might be loosely described as an organized crime racket occupying the upper echelons on government and industry. Aidan Monaghan on Mon, 04/12/2010 - 3:39pm. This was my first live television interview, so between that and hearing two different voices in two different ears, I didn't come off as clearly as I would have liked. But thanks for the kind words. Karl's a really nice guy, and the Reopen France crew was very receptive. enigs on Mon, 04/12/2010 - 4:03pm. Your answers were solid and confidently presented. ROBinDALLAS on Mon, 04/12/2010 - 8:57pm. ReOpen911France on Thu, 04/15/2010 - 6:22am. Nice job reminding everyone that France was one of the few countries which tried to expose the fraud being used to bolster support for the "war on terror". So much has changed since then. Recently, "Direct Matin" and "Direct Soir", two major freebie newspapers everyone reads in the metro in Paris, and elsewhere all across France, refused to take our money to place an ad for the DVDs available on ReOpen911's site. Oh well, c'est la vie. The truth will eventually come out. Thanks in large part to your efforts, Dylan, which have now resulted in the 9/11 Truth Movement that only moves in one direction: towards the truth. Merci aussi, BFM and Karl Zéro, for having the courage to have Dylan on your show, and thank you ReOpen911 for the great work you do. milongal on Mon, 04/12/2010 - 5:01pm. Debunkers consistently focus on their straw man argument of how and why US 'government did it' and how could the 'entire government' be part of an inside job, and how this couldn't be kept secret etc. These apparent perps must have worked in organized crime fashion to suborn, coerce, blackmail, intimidate other legitimate or unwilling players to make 9/11 become a reality. Yet other players have likely been made complicit along the way, most probably unaware, or willfully ignorant, of the crimes committed. Likely even more, even if aware to varying degrees, would not want to upset status quo or allow USA brand to be tarnished, or find that they receive benefit from 9/11 fallout. A real invesitgation would easily unravel the secrets, as many have been hinted at or outright discovered by 9/11 truth movement's independent work. An ironic twist is that most player's goals could be advanced by exposing the perps; imagine the massive boost to USA brand image if it were seen to expose such heinous crimes, clean house. The USA would gain an unparelled historic moral advantage, and regain huge trust from rest of world, that it could spend for decades to advance its goals. A thus freshly laundered USA could become the new clothes for the world .. if only the perps are exposed and put to trial. blogbart on Mon, 04/12/2010 - 7:46pm. John_Parulis on Mon, 04/12/2010 - 9:29pm. my beard has gone gray, I don't own a suit, I look wrinkly and old ... because I'm not young and handsome and clean shaven and well dressed I have no appeal and nobody would be interested in what I think so I should just shut up and hide away, I suppose. johnscriv on Mon, 04/12/2010 - 10:45pm. God forbid I grow my hair out for the first time since High School. enigs on Tue, 04/13/2010 - 10:57am. I've worked with John Parulis in person. I'm guessing he was joking. And I don't think it was Shayler's hair that made him go crazy. He's probably the victim of an MKULTRA style mind control operation. That's how they "got to" him, instead of just killing him. Adam Syed on Tue, 04/13/2010 - 3:05pm. Is absolutely adorable. Can we just be ourselves, isn't that good enough? Maybe we should all look as good as Cheney or C. Rice!! Jesse Ventura is not the type I would normally listen to, yet I find him interesting and intelligent in a strange sort of way. When we start pretendind to be what we are not, then we are no different than the people we are fighting with. Lillyann on Tue, 04/13/2010 - 3:24pm. enigs on Thu, 04/15/2010 - 12:32pm. Lilly Ann, May I correspond with you directly? David Slesinger on Mon, 04/19/2010 - 1:31am.